Questions of why always swirl in the wake of natural disasters. But like the popular game show, “Jeopardy,” the answers are in the form of a question. Every situation is a life lesson. I’ve worked up way too much spiritual perspiration trying to answer why my second-grade teacher committed suicide, why I was laid off from the perfect job in publishing—twice—or why bad things happen to such good people as you and me. I have learned that while why is often a futile question, God is more than willing to answer other questions. I can also find the answer to . . .
How can this situation make me grow more like Jesus? Who can I comfort with the comfort I have received? 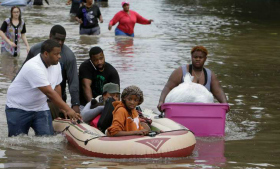 Let’s all comfort the people of Texas and Lousiana in our best way possible whether personally assisting, giving to the Salvation Army and other reputable relief organizations, or simply praying. Everyone can help! Adapted from The Psalms of Asaph: Struggling with Unanswered Prayer, Unfulfilled Promises, Unpunished Evil, which should be out the end of this month. Are natural disasters “acts of God”?